Since I began teaching online in 2000, I have noticed many trends in my online English courses; most notorious is the high attrition rate. In the last fourteen years, I have only taught one class that did not lose any students—one class out of approximately 170 online courses. Arguably, classes that meet face-to-face (F2F) also experience attrition, but online courses have developed a reputation for it, with many colleagues easily agreeing that 50% or more of the students who enroll in a particular online course will drop before the end of the term. The attrition rate for my online classes at Johnson County Community College (JCCC) has sometimes been higher, and I began wondering how much of the attrition is related to the fact that I teach the online English Composition II courses which are listed last in the schedule of classes each semester. What kinds of students are enrolling in those last-to-fill online courses? After trying to convince a few administrators to add a personality test to the entrance tests all JCCC students take, the chair of the English Department recommended we begin giving our students the Grit Test. 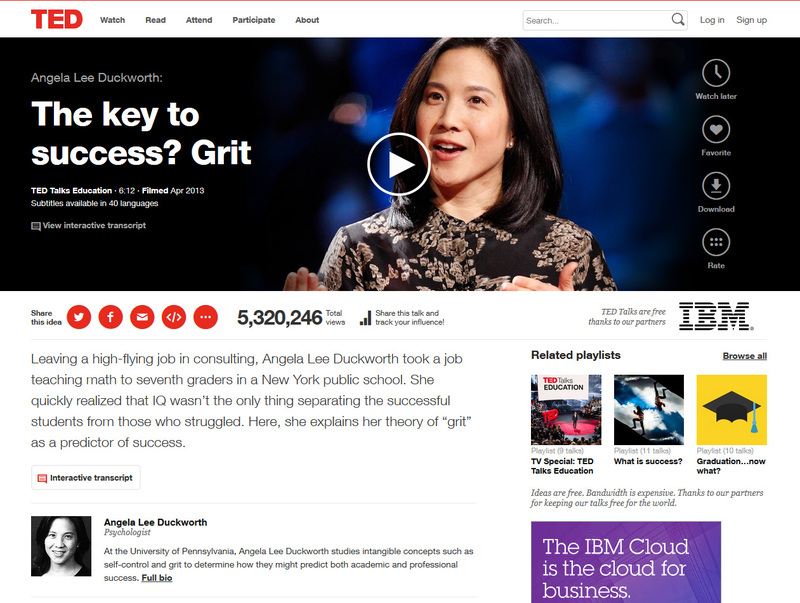 Angela Lee Duckworth explains how she helped develop the Grit Test, after realizing that grit is a measurable factor in many students’ success, in this TED Talks Video titled "The key to success? Grit". I leapt at the chance to help my students realize that online learning required grittiness. To be able to administer the test online and to collect data for comparison, though, I had to modify its format from this Grit Test. The version my students take is word-for-word the same, but has a numerical value based on 100%, instead of 10. This different calculation system needs more refinement, but more on that below. Why do students who score 90% or higher, drop soonest? And why do students who score less than 70% tend to stick with the course, even going so far as to check the class fairly regularly, but rarely complete the homework? In all eight classes, the results have been consistent. Those who score 90% or higher tend to drop after receiving their first essay’s grade, if not sooner. Those who score between 70% and 89% are the most likely to stick with the class through the whole 16-week semester, typically earning grades that are very close to their Grit scores. While some of those who score less than 70% often drop, many stick around, clearly checking the class, sometimes on a weekly basis, but rarely participate or complete the assignments. It is possible that the 90%+ students are really good at taking tests, so make great guesses as to which answers will paint them in the best light, so, in effect, falsify their grittiness. It is also possible that the 90%+ students are also perfectionists, so do not want to stick with a class that could jeopardize their grade point averages. What is perhaps more puzzling are the <70% students. Why would students “stick around” and even check a class in which they have no intention of participating? Is it possible that they are too afraid, both of participating and of dropping? Whatever their reasoning is, these students inevitably create a self-fulfilling prophecy, since, if they feel as though they cannot succeed in the course, their actions ensure that they do not. Does the 100% numerical system entice these students to alter their view of the Grit Test? Would the results change, if I figure out how to recreate the Grit Test’s point system exactly? I doubt either of these are real issues affecting the results, but I will do my best to try to recreate the exact structure of the Grit Test, since students cannot, as of the last time I checked the online link I shared above, email their results to their instructors. Meanwhile, I would love to know what results other instructors who use the Grit Test have found. (Note: The author may be reached at rheflin@jccc.edu). Dr. Ruth J. Heflin is adjunct professor teaching English courses at Johnson County Community College. She obtained her doctorate from Oklahoma State University, and has a scholarly book entitled, I Remain Alive: the Sioux Literary Renaissance, published by Syracuse University Press in 2000. Discussion of "Online Students Show 'Grit'"
Version 8 id 518968 of this page, updated 17 November 2015 by Shalin Hai-Jew. Created by Colleague 2 Colleague.